Brown wire is in fusebox on battery side, so to cut the ignition by the cut-off switch. My initial thoughts was this should work, but it doesn't. Everything is fine, but when the ignition is turned on there's some kind of noise coming from the coil area and the rev counter is irratic, if you try to start the car the ignition goes dead. I am presuming this is down to everything being taken off of one thick main wire coming from the positive terminal, but I don't see how that differs from having it coming off of the battery terminal, there all connected at the positive terminal anyway. 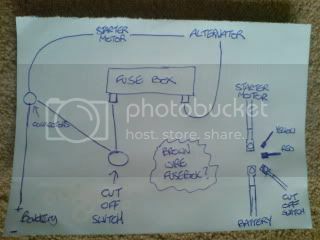 My question is, if I run a seperate wire from the positive battery terminal to power the fusebox/red/yellow wires will that solve my problem? Great if it does, but just a pain because i'll have two cables running side by side through the whole car. Only other thing is, does the airflow meter need to be earthed for any reason, as its attached to the battery tray, and isn't when I put the battery in the boot. Thanks in advance to anyone's help/thoughts and yes i'm mental to modify beta electrics, before someone says, "just why"
airflow meter as far as I remember is on bolts through rubber grommets so not earthed. 2. in a mini like fashion, fit a wire between the gearbox and the chassis, this is what was needed. If anyone ever wants to do the same it can be done, quite easily just remember to earth the engine/gearbox to the chassis via an additional wire. Pics / basic diagram available on request. Well done on solving the problem. Most common problem on any car is often an earth fault.